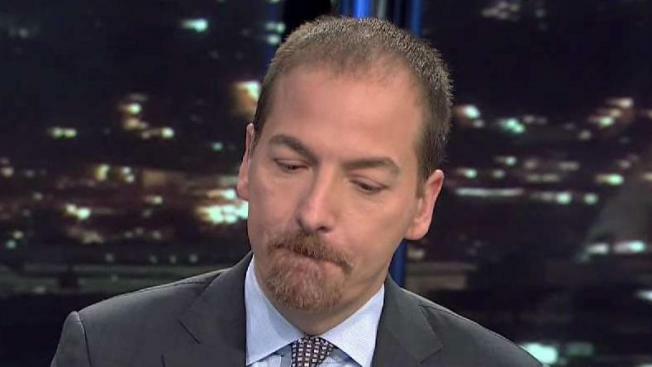 NBC News Political Director Chuck Todd responded to President Donald Trump's profane comment Saturday night at a rally in Pennsylvania, calling the "Meet the Press" moderator a "sleeping son of a b----." "I bring my kids up to respect the office of the presidency and the president," Todd told News4. "I don’t allow them to say anything negative, ever, about the president." Todd added that he has difficulty explaining Trump's language to his children, saying, "It creates a challenge to all parents when he uses vulgarities like that." At a campaign stop in western Pennsylvania on Saturday night, Trump attacked the press, criticizing how the media has covered the announcement that the president plans to meet with North Korean leader Kim Jong Un. Then, he singled out Chuck Todd. "I'm on 'Meet the Press,' a show now headed by sleepy-eyes Chuck Todd," President Trump said. "He's a sleeping son of a b----." Todd initially responded with a Twitter post urging viewers not to miss "Meet the Press" on Sunday. Ahead of taping "Meet the Press" on Sunday morning, Todd appeared on News4. Todd told News4's Adam Tuss that the rally showed that Trump believes his administration is accomplishing promises to shake up Washington, implement tariffs and challenge the media. "I think yesterday’s rally is a reminder he’s feeling great. This is the presidency he always wanted," Todd said. "Yesterday’s rally was sort of him unleashed, which is why he went after this favorite targets in the media." He also said the president's invitation to appear on "Meet the Press" still stands.